With Fortifi’s complete end-to-end cloud-based business platform, users can effortlessly plug a CRM management system into their website. The result is a comprehensive and simple view of multiple elements of your business, all of which can be customized to fit clients’ specific needs. When Fortifi began encountering issues managing its instance, it started the search for a reliable management system. 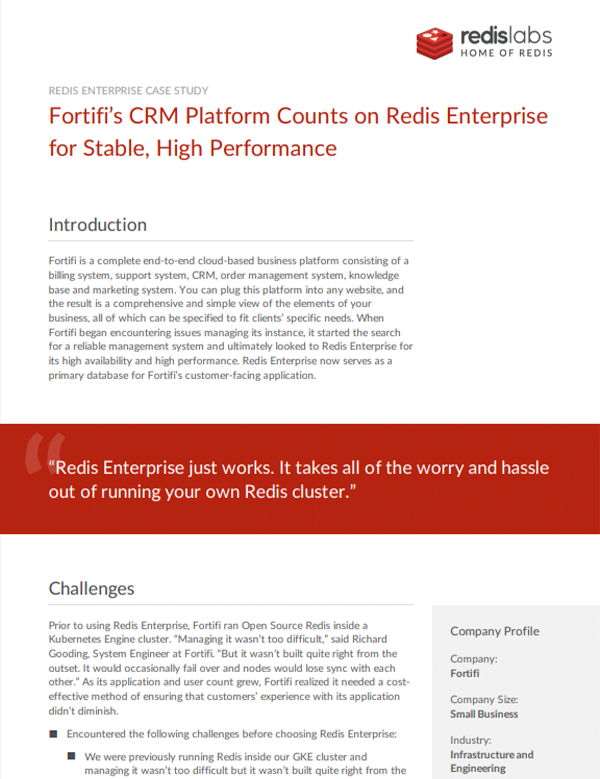 Ultimately, Fortifi chose Redis Enterprise for its high availability and high performance, which now serves as a primary database for their customer-facing application. A cost-effective management tool capable of ensuring a fast, comprehensive, and fluid customers experience. The instances we have running with Redis Enterprise have been excellent so far. We have had very few issues with performance or communication with the instances. Pricing is also excellent and the ability to resize instances without downtime is a major plus-point for us.